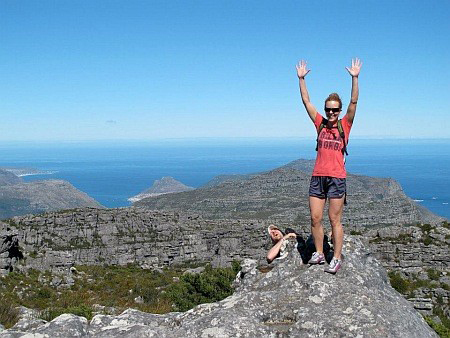 Lion’s Head is a short duration hike that starts on the road to Signal Hill. The hike takes only a couple of hours to complete and the scenery from on top of the mountain is nothing short of spectacular. To find the appropriate time it takes to hike Lion’s head, you will need to consider your fitness level as well as how many people are attending the hike, if in a group. On average Lion’s Head hike takes between 2-3 hours to complete. AVERAGE TIME TO HIKE LION’S HEAD. The time it takes to hike Lion’s Head depends on the fitness level of the individual. Usually it takes between 2-3 hours to complete a full hike up Lion’s Head and back down again depending on how fast the group moves. This time it takes to hike up Lion’s Head is including breaks for photos and refreshments. If you are an average fitness level and are able to complete moderate intensity exercise then Lion’s Head hike will be possible in the aforementioned time of an average of 2-3 hours. BEST TIME TO HIKE LION’S HEAD. The best time to Hike Lion’s Head is sunrise or sunset. The time it takes to hike Lion’s Head is estimated at 2-3 hours. If you join our sunset hike starting at around 4:30 PM, you will see the moon and stars rise over the city of Cape Town during your decent down the mountain. The hike down Lion’s Head is quicker than the hike up Lion’s Head. So if you are hiking either for sunrise or sunset, be sure to plan at least 1.5 hours up Lion’s Head and 1 hour to return down the mountain. For the Sunset hike be sure to bring illumination because the best time to hike Lion’s Head is also the darkest time. There is no path lighting at night for the Lion’s Head hike and your guide will provide you with or have additional lighting headlamps available if they feel the need for you to use them. DURATION OF LION’S HEAD HIKE. Lion’s Head duration: 2-3 hours. The hiking duration of Lion’s Head is calculated by a distance of 5.5 km round trip. That takes you 1.5 hours to hike up Lion’s Head and approximately 1 hour return. The duration is also dependent on the group size and the weather on the day of the hike. Keep in mind that this duration is an estimate only and if the group takes longer than expected then the time it takes to hike Lion’s Head will increase in time. QUICKEST ROUTE TO HIKE LION’S HEAD.